A young man around 14 years old, wearing his Chicago Cubs cap backward, returned late to his seat in front of me last night as tapper Yuji Uragami performed a solo a capella. In just three long strides, this kid slipped past half a dozen people and into his empty chair. He didn’t make a sound. This kid knew how to make a move without leaving a trace. But he probably also knows how to make noise. The Edlis Neeson Theater at the Museum of Contemporary Art on August 1 was full of adults, yes, but also many young ones and teenagers. “Solitary Soles,” the first of three programs this week of Chicago Human Rhythm Project’s annual series, “JUBA! Masters of Tap & Percussive Dance,” coincides with “Rhythm World,” its summer festival of master classes and workshops, now in its 22nd year. Since July 23, a crop of rising talent has spent its days training with Jason Janas, Derick K. Grant, Dianne “Lady Di” Walker and CHRP’s Lane Alexander, at the newly christened American Rhythm Center in the Fine Arts Building. Through August 5, “Rhythm World” continues with courses including a three-day session for hoofers ages 9 to 12 and two programs for tap ensembles. At night, the students watch their summer teachers — among today’s top talent worldwide — perform live, and learn even more. 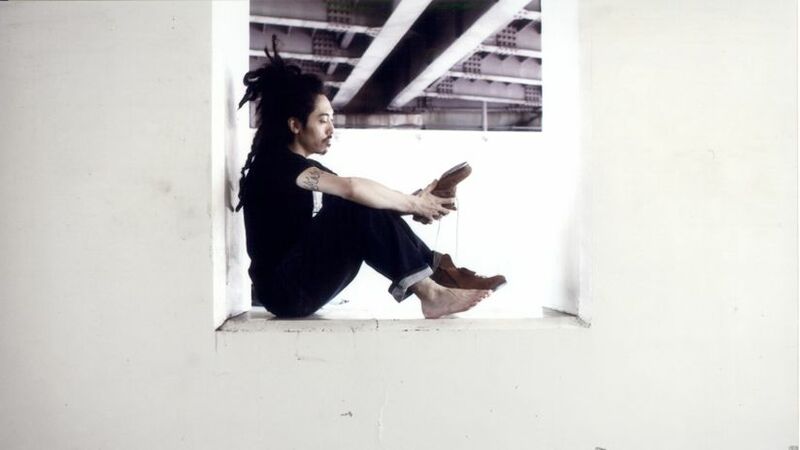 Uragami is a thin man from Tokyo with wild hair. He’s quiet, for a tapper, and his moves are quiet as well. But the precision of his timing and the velocity of his rhythms are hard to believe. He’ll bend a string of hundreds of taps, which pass in a matter of seconds, gently into peaks and troughs of volume. He’ll slide around himself in a squarish path along the floor in a sort of crip walk, peppering his slick steps with witty tangents of percussion. He finished one of two solos with a series of eight-count phrases during which audience members snapped their fingers on each sixth and seventh beat. This participation was requested, fulfilled and finished with such subtlety that the interaction seemed choreographed in advance. Ten other dancers performed and the onstage jazz ensemble, the Greg Spero Trio, performed a set of its own. Opener Janas delivered a solo so wide-ranging in its structure that Alexander, who hosted, joked afterward, “I think he used up all the steps.” Janas began in response to the trio’s repeat of three simple chords, which opened up into a rendition of “Unforgettable” by Nat King Cole. Janas, breathing heavily, finished his performance with a tidy turn and a salute. The audience roared. Chicagoan Starinah “Star” Dixon is one of 11 dancers I named last year who made huge first impressions. She takes the stage with a deep seriousness and pounds it with rhythms as if she’s digging them up out of the ground beneath her. Among the performers in “Solitary Soles,” she’s young and relatively rough around the edges, but it’s impossible not to connect with the emotions that drive her feet. Dixon danced to an arrangement of Stevie Wonder’s “Pastime Paradise” in a way that recalled Coolio’s track “Gangsta’s Paradise” (which samples Wonder’s tune). A step-for-step recreation by Glenn Leslie of Gene Kelly’s famous barn dance, from the 1950 musical Summer Stock, was a tender nod to tap history on a program otherwise focused on its future. (This August 23 would be Kelly’s 100th birthday.) Nicholas Young, dapper in a brown jacket, bow tie and hat brought Kelly-esque charm to his interactions with the Spero trio and, at one point, with a circle of light on the raised floor custom-installed for the “JUBA!” programs. Like Dorothy in The Wizard of Oz, Young clicked his heels together twice to tie off his segment, then strutted like a dandy offstage right. 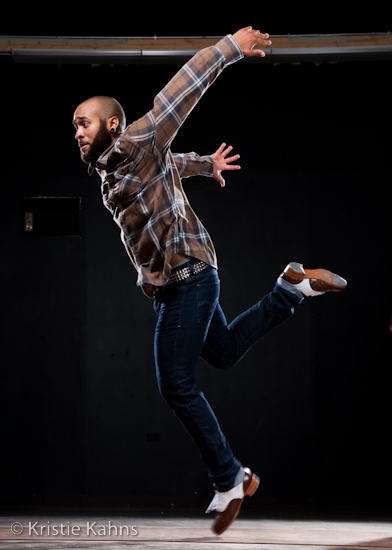 Another Chicagoan, Jumaane Taylor, represented contemporary tap with a hipness. From his beige shoes to his skinny jeans and studded belt, paired with a Ben Sherman–looking shirt and narrow tie, to his full beard, shaved head and bright smile, Taylor was totally today. Spero turned away from his grand piano to play a Roland synth for Taylor’s set; Eric Hochberg traded his upright bass for an electric one and drummer Ernie Adams coaxed a shimmering landscape from his cymbals and hi-hat. I’ve seen Taylor tap before but his solo for “Solitary Soles” was a revelation. Like Grant, he builds for himself physical challenges out of big movements. Both hoofers live on the edge of not being able to bring that other foot down in time; of skating too fast to not fall down; of tripping themselves up into pretzels. Grant might be the reigning king of high stakes: His own solo, to “My Funny Valentine,” brought me to the edge of my seat. Taylor might be the prince. Joining Grant in the second half were Alexander, Walker, Sam Weber and Dormeshia Sumbry-Edwards — a veritable “who’s who” of American tap. Each commanded the stage in his or her own unique, signature style. Alexander’s is elegant, refined and intellectual; his take on two works for solo piano (Bach’s French Suite No. 3 in A Minor, and a B-minor prelude by Liszt), played by Joffrey Ballet principal accompanist Paul James Lewis, showed profound knowledge of classical music. The night’s energy seemed to put an extra spring in Alexander’s step. Walker, whom the audience greeted with thunderous applause, asked Spero’s trio to play a short encore of “Autumn Leaves,” which she heard while waiting to perform. The ingenuity with which she decorated the standard seemed effortless — and she even posed a few times for an unseen photographer in the wings. Weber — the first tapper to win a “Bessie” award, according to his bio — was introduced by Alexander as “the Glenn Gould” of the art form. He’s a tall, gentlemanly performer who shoots off creative sparks lightly; his flights of fancy were to his solo as his red pocket square was to his black silk shirt, tucked neatly into black-belted black trousers. In contrast, Sumbry-Edwards was all red — literally. She strode onstage in tight crimson pants and a matching top, with gold shoes like Michael Johnson’s to match her earrings, necklace and pants buttons. (Whoever helmed the lighting board bathed the stage backdrop red in reply.) Stopping and starting, taking breaks to listen to the trio, Sumbry-Edwards closed the show the way a perfectly pulled espresso shot closes a long and satisfying meal. She, like no other tapper I’ve heard, actually caffeinates space. “JUBA! Masters of Tap & Percussive Dance” continues August 2 and concludes on August 4; according to the Museum of Contemporary Art website, both performances are sold out. “Rhythm World” classes continue through August 5.